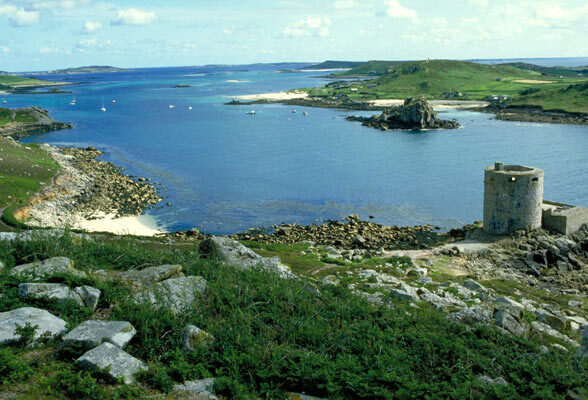 The Isles of Scilly are located just 28 miles off the Cornish coast in the Atlantic Ocean. Comprising five inhabited and numerous uninhabited islands, Scilly has been rumoured by the British press as one of the places that Prince William and Kate could spend their honeymoon on. So why would Scilly be suggested as a honeymoon destination and what do these islands have to offer the newly-wed Royal couple. Scilly is not a new holiday destination for Prince William, although it was a long time ago that he holidayed there with his parents and brother, Harry. The islands can only be accessed by air or sea, giving a sense of escape. The place is small enough for security to keep a watch over and its distance from the mainland would allow privacy for William and Kate. After the public spotlight of their Royal Wedding, who can blame them for wanting some privacy. There are no cars on the Isles of Scilly and the scenic islands are ideal for romantic walks. In late spring, Scilly’s famous daffodils are still in bloom and the islands are awash in colour. Sailing around the uninhabited islands and exploring these by boat is another romantic activity. There is the abundant marine wildlife to see, including puffins, basking sharks, gannets and even occasionally whales. For those who prefer to spend time on land, there are ancient monuments to discover, horse riding along the beach, and castles and forts to explore. The only reason why the idllyic Isles of Scilly fail as a potential honeymoon destination for William and Kate is Scilly’s World Pilot Gig Championships, an annual event that takes place during the May Bank Holiday. During this major event on the island’s social calendar, flocks of visitors come to watch the traditional rowing races and join in the celebrations on the beach. If you’re planning a honeymoon on the Isles of Scilly, avoid the May Bank Holiday. The Scillonian III passenger ferry operates from Penzance from end March to end October only. There is a helicopter service from Penzance. You can fly from Exeter, Bristol and Southampton airports during the main spring, summer and autumn season. There are no hire cars on the islands, but there are taxis on St. Mary’s.